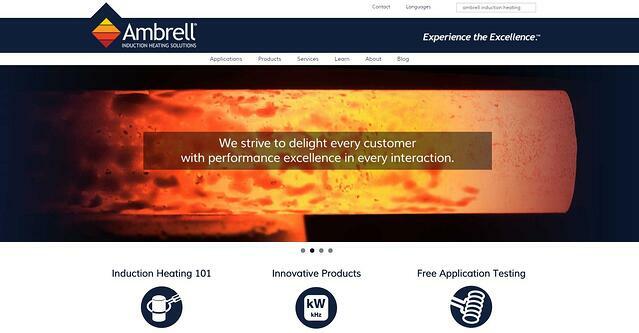 Ambrell, providing the expertise and products that manufacturing companies must have to use induction heating, announced today the unveiling of its redesigned website. The new website offers quick and easy access to helpful information, from beginner-level to expert-level, about induction heating and all of the company’s products, Applications Laboratory services, technical support. field services and more. Incorporated into the new website is more content than can be found anywhere else on the web for topics on induction heating as applied to industrial production. On www.ambrell.com there is a library of hundreds of application notes and videos on induction heating processes. Exclusive to new visitors, customers can sign up online for FREE testing of how induction heating can be used on their parts, a value-added service offering through the company’s Applications Laboratory. As many industry veterans know, Ambrell has three (3) Applications Laboratories, located in the United States and Europe, that serve global customers by helping solve the most complex industrial heating problems including brazing, welding, soldering, heat treating, forming, melting and the list goes on-and-on. Also new to the website is Ambrell’s exclusive PRO Skills™ Webinar Training designed to help customers enhance their professional skills in the use of induction heating systems. The new PRO Skills Webinar Training gives customers access to virtual training that’s convenient, easy-to-follow and interactive in a wide range of industry topics. In addition, the website utilizes today’s responsive design technology that provides ideal viewing on various web browsers and mobile devices such as tablets and smartphones. It has been designed for the person searching the web for content to help them optimize and improve complex manufacturing processes. To view the new website, visit www.ambrell.com . For additional information call +1 585 889 9000.